Excellent Parts,Fast Shipping, Super Ebayer!!!!!!!!!!!!!!!! I originally bought these body mounts to cure the sagging body line on my 03 crew cab. These had no issue curing that issue, It solved that problem beautifully. They also cured another issue I had - a weird kick/jolt over harsh bumps in the road. Being a 3/4 ton truck with added air bags, I just assumed it kicked because of the suspension... but after doing body mounts, the kick has softened quite a bit. I assume this is because the cab isn’t able to bounce off the frame like it could with the soft blown out rubber mounts. it still does kick over bigger bumps, but nowhere near as bad as it did before. Having the cab securely mounted to the frame really has improved the ride and handling of the truck compared to 175k mile oem mounts. My Truck feels like new !!! 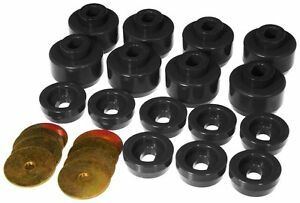 The cab bushings are way better quality than OEM. Was able to do all the work myself. Save a lot of money. Highly recommend this to anyone who wants a new truck feel. Definite good value for the quality and price. Better made And cheaper than OE replacements. Highly recommend. parts are of good quality and fit like a glove . nice product and at a fraction of original equipment.